In a data-first world, the marketing analytics is now becoming the process of connecting marketing function with the business intelligence. The demand for specialized marketing analytics consultant is becoming essential to bridge the gaps in marketing data and to extract business insights. The main question in every business -from a small start-up to a well-established organization- will always be: Do we get the most accurate informed-decision/actions our of our data? The market research is telling you that the region you are targeting is highly profitable. All figures and surveys are providing very positive indications. You launched a campaign for few months but the campaign results are very poor. Where do you need to search for the problem? The common conclusions are: The market research is not accurate, the product offering is not competitive enough, the brand is new in the market and you need to allocate more budget for awareness. Any or all of this could be the reason but how you can get sure which one has the biggest impact? You hired the best creative team or agency which provide you with great visuals and UX. Yet, the conversion is still low and you are you are losing a lot of money on advertising. How can you indicate the problem? Is it the creatives you need to change or the performance team that is not managing the budget allocation properly? Your sales team are commonly reporting that the marketing team is not driving quality leads while your marketing team is telling that the sales department are not performing effectively. How can you find out which team of the two is underperforming? You have so many analytic tools and each one of them has its reports. You are not sure how to combine and simplify all this amount of data and report the right insights to your management. All this data is still not getting you anywhere when your CEO asks about the actions required to increase ROI. With all these issues a business can either go wrong and lose money or define the problem, raise flags and take an effective decision. Holding many meetings and listening to different opinions from the team is not what companies need to survive in such evolving situations. Numbers, technology, market trends and consumer habits are changing and you have to move faster. How can a marketing analytics consultant shift the way you are looking at your data? Bringing data to the core of your decision-making process doesn’t only require technology and advanced automation platforms. A tool can give you the real-time figures but creating a relation between data and extracting an action is the biggest problem for any organization. One of the major challenges CMOs face: finding professionals who can not just analyze data but most importantly to extract the critical insights. Data analysts are qualified to analyze the data but the marketing teams are always in need of a consultant with experience in both analytics and marketing strategy. 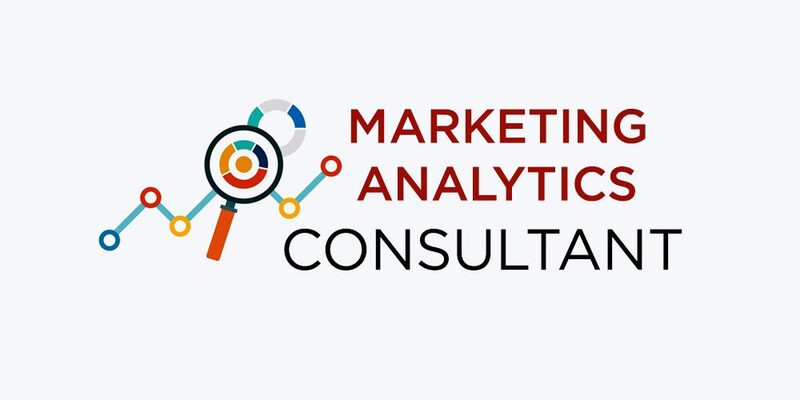 Here I would love to share some of the main functions of the marketing analytics consultants and how it can help the stakeholders to solve business problems. Starting with the strategy, consultants can always organize the marketing analytics process by building an effective strategy based on their findings. Establishing a custom analytics plan would provide efficient outcomes and controllable workflow. Research the data sources and define what the marketing need to design a more effective process to collect, analyze and extract insights and patterns. Tip: Google analytics reports and Facebook insights are not customize designed tools that are built to answer questions. Each business shouldn’t rely on extracting the built-in reports and develop his own customized insights. The process of reporting should start with a business question such as; how we are improving our ROI? The reports are meant to provide answers and indications and not just metrics. For more information about marketing analytics strategy, read the article: 5 Effective Tactics for Marketing Analytics Strategy. Are you collecting the data you need at right timeframe and at the right volume? Getting overwhelmed with the vast amount of data availability is a mistake. Tip: Insights are more important than data. Choose a professional consultant who can help you to stop chasing all the metrics and organize your reports. There are several issues in organizations that prevent management from solving problems. Among the top issues are the common one; themselves. In many business cases, the way the senior management identifying the is the problems is not accurate and that’s why they need an outside eye (different perspective). Consultants often work with many different companies and may have faced the same problem you are struggling with in the past and tested multiple solutions for it. They can provide a perspective based on what they’ve experienced and provided more insights into what is working and what is not. An analytics consultant can bring in a more innovative solution and marketing technology ideas and advice which is suitable for your business which can save can cut the cost for budget and the resources required to implement a change in the department. The consultants’ task is to define the gaps and highlight the performance issues which can resolve the conflicts between internal teams. This can solve several issues between different team members and defining the most relevant KPI. Understanding not just the performance of the channels but also the performance of the team members and roles. A professional consultant can help you to understand the critical gaps in your marketing performance and raise the flags for urgent matters as well as drawing attention to milestone wins. Tip: Each organization might be full of certain rules and policies that can prevent internal teams from implementing major changes. An outside expert can help you to push the change and implement new tactics in a shorter timeframe. 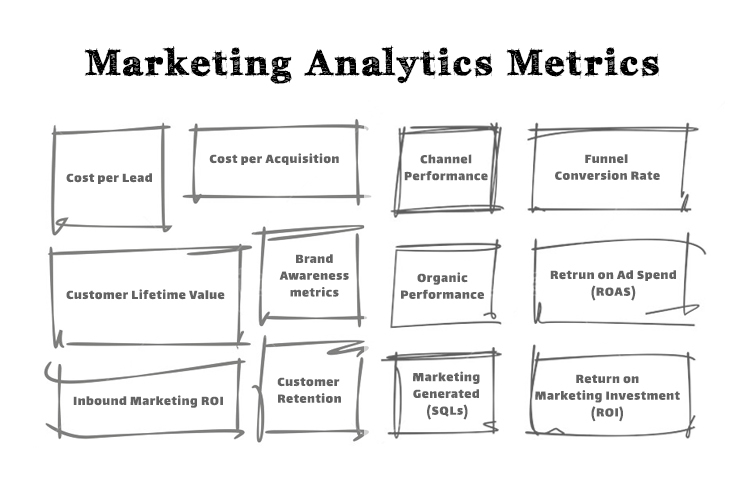 One of the key roles for marketing analytics consultant is to cover your team’s knowledge. The consultant can save you time and budget required for an extensive amount of training or additional full-time talents by training your team and providing the right approach for data analytics. A professional marketing analytics consultant can help to structure your marketing team and identifying the knowledge and resources required. In some cases, a consultant can help you to avoid new hiring by implementing automation tools or delivering a sufficient analysis on regular basis. The team can benefit from the consultant experience and enhance their skills as well as avoiding longer time in technical troubleshooting and research. 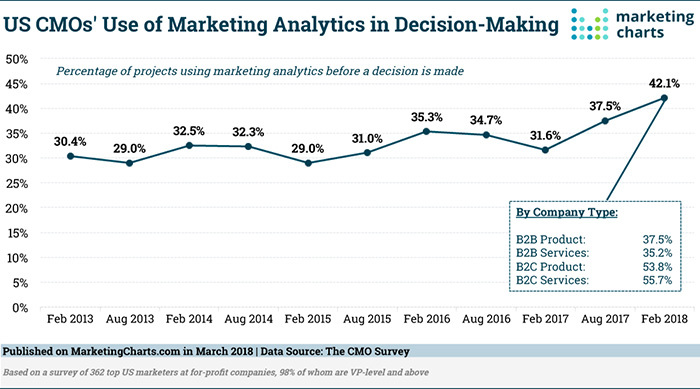 In conclusion: CMOs say just 42% of marketing decisions are made using analytics. Eventually, CMOs still report that they are still struggling with analytics. While the marketing technology and cloud solutions are providing advanced capabilities in combining offline and online data, the lack of talents who are experienced in both data analytics and marketing is a challenge. A specialized consultant who has the knowledge of data analytics tactics and marketing initiatives can drive the marketing department towards the business goals. Putting all the wide collection of data (media, paid advertising, organic, social media, digital marketing, mobile marketing, customer relationship management and email marketing) into an insightful pattern can shift any business into a real customer-centric company.